You spent a lot of money on a quality hot tub cover. So why should you invest more money by installing a hot tub cover lifter? Depending on the size of your hot tub or spa, the removal and replacement of the hot tub cover can be daunting. 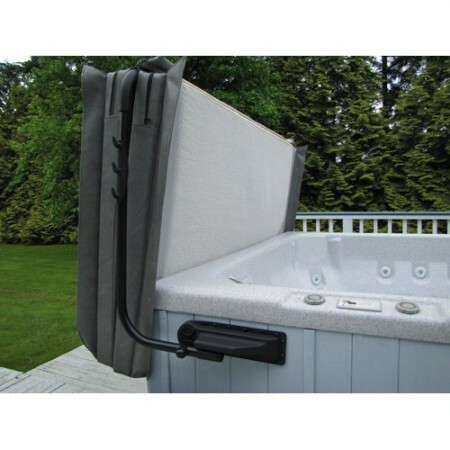 A hot tub cover lifter is designed to simplify the process. From manual aids to hydraulic lifters to gas lifters, there is a style and solution for every budget. – Be as effortless as possible to remove and replace. – Fit any size of hot tub you might have. – Protect the cover as it is being lifted. – Adjust to any height you might need for the surrounding space. – Fit into even very tight spaces. – Install easily – no need to call a handyman. If the opening and closing of your hot tub cover feels like a chore, it might be time to explore your options. The team at Hot Tub Covers Canada has put together this handy cover lifter comparison chart. We urge you to review the varied selection and call us at any time with your questions.